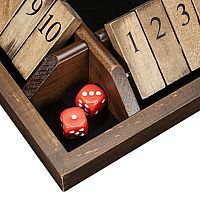 Shut-the-Box is a traditional game of counting, addition, and probability that dates back to the 18th century when the game was enjoyed by Norman fishermen after a long day at sea. Today the game is played with family, used in classrooms for teaching addition and probability, and is even a betting game played in pubs all over Europe! Roll the dice and lay down any numerical combination of tiles that match your roll. Just keep on rolling until you can no longer match your roll on the remaining tiles. 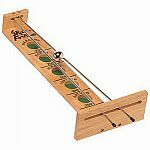 The lowest score wins the game. If you lay down all the tiles, then you've "shut the box." 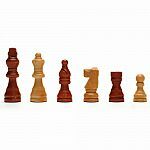 This four-sided version is made of medium stained wood with a felt playing surface. 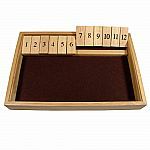 It features 10 wooden number tiles rather than the typical nine numbers of other versions, bringing more numerical combinations into play. 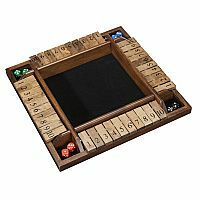 Can be played with any number of players, but the 4-sided board makes it ideal for four players. 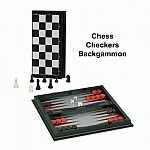 Sure to bring hours of enjoyment and old world charm to your home. Includes eight dice (4-different colors) and instructions in the beautiful WE Games packaging. Measures approximately: 14.50 x 2.50 x 14.50 inches..